An energetic breath and movement yoga class that utilizes a flowing of postures to generate heat within the body that will increase your strength, flexibility, endurance, balance, relieve stress and promote overall wellness. The teacher will first guide the students through a flow together and then the class is given space to move at their own pace. This vinyasa class is for all levels including students who are physically active, students who are interested in the fitness benefits of yoga, and for students who want to jump into a multi-level and strong practice. The class is usually accompanied by upbeat music. For all levels although some hatha yoga experience is recommended. Temperature 70°-75°. Experience a heated and energetic breath & movement yoga class that utilizes a flowing sequence of postures to generate heat within the body that will increase your strength, flexibility, endurance, balance, relieve stress & promote overall wellness! The teacher will first guide the students through a flow together, then, the class is given the space to move at their own pace. This Hot Vinyasa class is for all levels; new students who are physically active, those who are interested in the fitness benefits of yoga, and for anyone who wants to jump in to a multi-level and strong practice. The class is usually accompanied by upbeat music. For all levels. Temperature 80°-85°. This style of vinyasa yoga is a dynamic and challenging combination of strength, sweat and spirituality. Power Vinyasa gives the body the ultimate detox while building endurance and gaining balance. This upbeat, athletic, and flowing form of yoga will strengthen both your Body and Your Mind. This Class Focuses on strong poses synchronized with the strong breath practice used in Vinyasa to tone every muscle, while calming your mind.This class has variations and modifications, making it available to any yoga experience level. Come Ignite the Fire and find Your Inner Warrior! Let us take a journey within and rediscover the profound interconnectedness of our mind, body, and spirit. Over the course of 8 weeks, we will break down each energy center’s anatomical correlation by exploring the organs and bone structures that are located at and support each energy center. This exploration allows us to tune into the energetic subtleties within us, through physical alignment in our bodies. 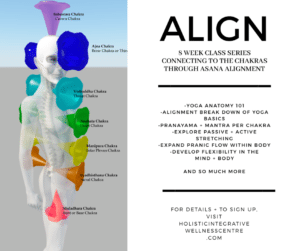 When alignment is present, PRANA, vital life force, has clear channels and pathways to travel within the body. Week by week, we will peel back the layers of our self to dive deep into our own human experience. Redefining our understanding of present, conscious movement in efforts for these teachings to extend into our daily lives. It’s time to A L I G N – mind, body + spirit. Contact us today about our private group sessions! We can even travel to you! Interested in renting our space? Please contact us for details!